Like all meetings, this year's Human Brain Mapping conference was packed with the ubiquitous blend of brilliance and social awkwardness that permeates nearly every neuroscience meeting. That's why I like science. Real geeks, unlike chic geeks, embrace the fact that they live 90% of the time in their heads, trying to frame the world that they see into the science that they know. Either trying to understand how something works or what would happen if two disparate things were suddenly fused together to make something new. Most of us are constantly living in our own heads. That's why the "absent minded professor" isn't really much of a stereotype as it is a valid descriptor of our behavior. But it is this mental wandering that makes good scientists great. Daydreaming has it's creative advantages. Those "what if?" or "how did that work?" scenarios that constantly bounce around within our cranium are the key to pushing science forward. 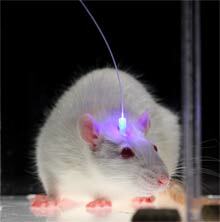 Case in point, the story behind "virus-guided laser neurons" (also known as "optogenetics"). For those of you who have never heard of optogenetics, it's the mind blowing technology by which viruses are used to insert genetic material from algae or bacteria into the neurons of living mammals. This genetic clipping changes the properties of neurons so that they will either fire or not fire in response to light pulses of particular wavelengths. You heard that right. Viruses change neurons so that they can be controlled by lasers... in living animals. I'll let you think about that one for a minute. This technology was developed by Karl Deseroth and his lab at Stanford around 2004. In just a short time, this tech has revolutionized neuroscience and lead many to speculate (privately and openly) that the Nobel is waiting in the future. Dr. Deseroth was featured as a keynote speaker last week and while the whole lecture was absolutely fascinating, something he said at the beginning caught my attention. Deseroth mentioned that when his lab started working on the idea of optogenetics, they were using funds from a grant from the National Institute of Mental Health that had proposed to do something VERY different. But his lab wanted to try this new venture and they took the risk and it paid in dividends. "It's a great example of the need for creative exploration," Deseroth said. And therein lies one of the many problems facing today's researchers. Funding agencies like the National Institutes of Health (NIH) are taking fewer and fewer risks in science. They're hedging their bets on what seems to be the safest horse and in the process stifling most of the creative processes that lead to developments like optogenetics. As the government cuts more funding to science and education, what's left in the pot gets distributed mainly to the established laboratories who are building on established ideas. Ask anyone who's written an NIH grant recently about the process. Go ahead, buy them a beer. They'll go on at length about how you need to have already finished half the experiments that you "propose" to do in the grant application. This is before it's even considered "fundable." Indeed, the average age at which researchers get their first full NIH grant is now 43 years old! Consider that most professors start their first position in their mid-to-late 30's. As a result, most scientists in my field spend a vast majority of their time designing and performing research projects that they don't really want to do. They write grants to tell the NIH what it wants to hear. They'll write grants creatively dancing around the projects that are of interest to them, so that they can get the funds to do the real science. I've even had one established scientist (with decades of experience in neuroscience) tell me that he always writes grants knowing that he'll only do 50% of what he proposes. He'll then spend the other 50% of funds on projects he really wants to do. This problem is compounded when you consider that, in neuroscience, the current funding rates for grants at the NIH range from ~2.5-16.0%, depending on the agency (down from a stable ~20-25% in the 1990s). That's a lot of highly intelligent brain power being wasted on useless dead ends that could be spent creatively exploring something really interesting. Unfortunately, that's the dirty secret of the world in which we do science in this country. Unless it changes, the US may stop becoming the place where people can turn crazy ideas like making virus-guided laser-neurons into a reality. In the meantime, I'm going to keep on daydreaming my weird science ideas.